﻿ Who may get a USPA press pass? Who qualifies for a press pass? Who may get a USPA press pass? In principle, a press pass from the United States Press Agency (USPA) may be issued to anyone who practices journalism. This distances the USPA from many other press associations and press agencies, which usually only issue press passes to full-time journalists. However, the United States Press Agency wants to support the work of all journalists, which is why such a limitation doesn´t exist. This does not mean, however, that a USPA press pass is an inferior document. The press pass of the United States Press Agency is valid internationally and recognized by numerous agencies, businesses and institutions. As the owner of a USPA press pass, you may conduct your journalistic work without hindrance and will experience advantages during your research or when it comes to access to events or blocked-off areas. With the help of customized identification and safety features, its owner may be clearly identified as a journalist. During on-site coverage of breaking news, the USPA press pass offers access to areas that are blocked off to the public. Furthermore, it facilitates the communication with agencies, institutions and other sources, as well as general every-day research. A press pass allows police officers and firefighters to clearly identify its owner as a journalist and establish a separation from merely curious spectators. As an official media representative, the owner of a press pass has additional advantages, e.g. more willingness to provide information during trade shows or access to areas that are blocked off to non-journalists. A press pass is indispensable during every-day journalistic work, as it offers various benefits. Attending events is significantly easier with a press pass. Whether concerts, trade shows, sporting events, movie or theater premieres: Many social events only allow access for people who have been accredited in advance and who can present an official, valid press pass. Agencies, institutions and event organizers see a press pass as identification and proof that its owner is active in the field of journalism. 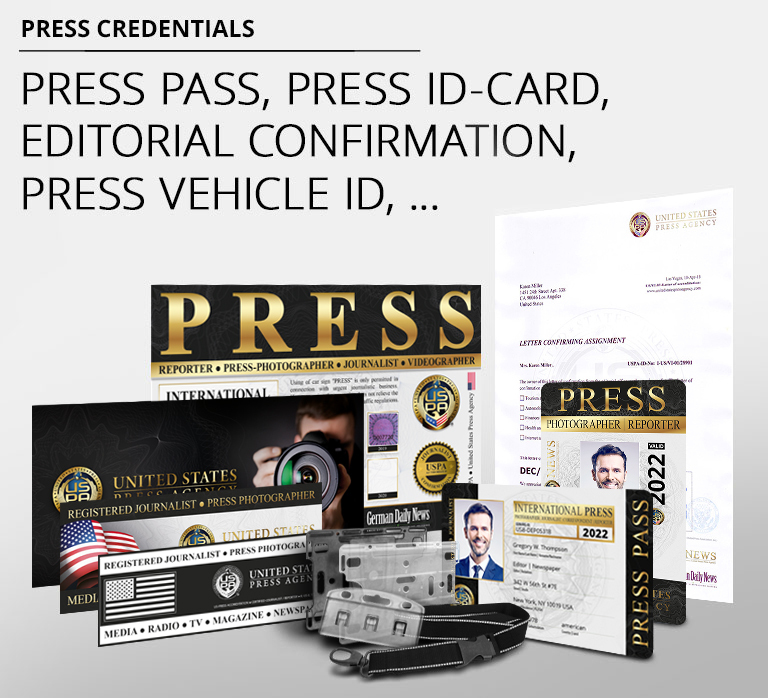 With the United States Press Agency (USPA) press pass, you´ll receive a document that´s valid around the globe. 1. Who may get a USPA press pass? In general, anyone who is active in the field of journalism, whether full time or part time, may apply for a United States Press Agency (USPA) press pass. 2. Who issues the USPA press pass? The USPA press pass, which is standardized across USA and Europe, is issued by the United States Press Agency (USPA). 3. When does the USPA press pass expire? The press pass is valid for the calendar year that is printed on it. Before the expiry date, a new press pass is issued, which is valid for the following year. This guarantees the possession of a valid press pass without interruption. 4. What´s the annual fee for the USPA press pass? A registration fee of USD 108.00 is due upon application for the press pass, along with the annual fee of USD 48.00 for the first year. The fee includes a credit-card-size press pass, press vehicle ID, a neck strap and a credential holder. 5. Is the USPA press pass recognized everywhere? The press pass of the United States Press Agency is recognized internationally by agencies, institutions, event organizers and businesses. 6. How do you get into events for free and gain access to blocked-off areas? In most cases, a letter of letter of accreditation from the editorial office or accreditation prior to the event is required in order to attend without paying admission. On site, simply present your press pass to receive access to areas that are blocked off to the general public. Press pass carriers also find it easier to obtain information from sources. 7. Does a journalist have special rights? Yes indeed. However, the privileges offered to journalists vary from country to country. One thing is true around the world, though: A journalist has a duty to report, which must not be refused. 8. What other advantages does the USPA press pass entail? Access and parking at events is much easier with a press vehicle ID for your car. In addition, you´ll receive financial benefits from numerous businesses that offer special discounts for journalists, e.g. from car dealerships or mobile providers. Facilitate your journalistic activities as a Journalist, Press-Photographer, Blogger, Videographer, Freelancer, Sport, VIP, Event-Reporter and Correspondent. Inclusive valid Press Pass, Reporter Card, Letter confirming assignment, Press Vehicle ID, eBook, Lanyard and Sticker.